Pheasants are easily recognized by their colorful plumage. Since their introduction from asia in 1881, they have spread over many states from the West, across the Midwest and even into the Northeast. 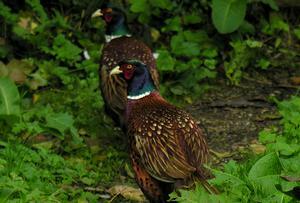 Pheasants are not found in most Southern areas or in deserts except in irrigated agricultural lands. There is some controvery over the continued introduction and management of an introduced species instead of native species, but pheasants can live in modified habitats and in areas with human disturbance where wild native grouse can not. Ring-necked Pheasants are most commonly found in open fields and agricultural areas, especially areas that are intermixed with marshes, hedgerows and brushy areas that offer cover. Diet: Omnivore: Insects, terrestrial and aquatic invertebrates, small vertebrates; seeds, grain, fruit. Voice: Male display a loud, harsh, hacking uurk-iik followed by short burst of noisy wing beats. Male gives loud, harsh cackle when flushed; both sexes give a variety of low, clucking notes, some very similar to domestic hen. Habitat: Found in open country, farmlands, brushy areas, woodland edges, marsh edges, fields. Displays: Courtship: male on "crowning territory" rises high on feet and calls loudly while rapidly but briefly flapping wings; struts in semicircles around female, head tucked, tail spread, and wing toward female drooped. Nest: Usually concealed in grass, weeds; shallow depression, occasionally barely lined with leaves, grass. Eggs: Averages 10-12 brownish-olive eggs, occasionally pale blue, unmarked. 1.6" (42 mm). Longevity Record: No Official Longevity Records are kept by the the USGS Bird Banding Lab, because Pheasants and other gamebirds are not migratory and are not banded with USGS bands. Banding may be done by the State Wildlife Agencies with gamebird bands. Instead of Longevity, wildlife management agencies are more concerned with survival. For example, in a mild winter in good habitat, 95% of pheasants may survive, but in a severe winter in poor habitat, only 20% of pheasants may survive. Only a small portion of any pheasant population will be more than five years old. The chicks are very young and the female shows them what to eat. Nice video showing the colors of an adult male Ring-necked Pheasant. The Ring-necked Pheasant was selected as the State Bird of South Dakota by the State Legislature in 1943. It was introduced from Asia to the U.S. (Oregon) in 1881 and into South Dakota in 1898. South Dakota, Delaware and Rhode Island are the only three U.S. States that have selected non-native birds as Official State Birds. Go to Delaware State Bird (Blue Hen). Go to Rhode Island State Bird (Rhode Island Red Hen).